Today's guest post by Susanne Myers and Tracy Roberts from www.PiggyMakesBank.com shares how to repurpose your PLR multiple times. If you’ve read the first two post in the series about using PLR (post 1 / post 2), you know that buying and using PLR is a great way to save time and money. Today, we want to show you how you can leverage every single piece of PLR you buy even more – by using it multiple times. Yep, you read that right. You can use and reuse the same content several different times and if you do it right, your readers will thank you for it. Most of us start out adding the PLR articles to our blogs. That’s great. But don’t stop there. 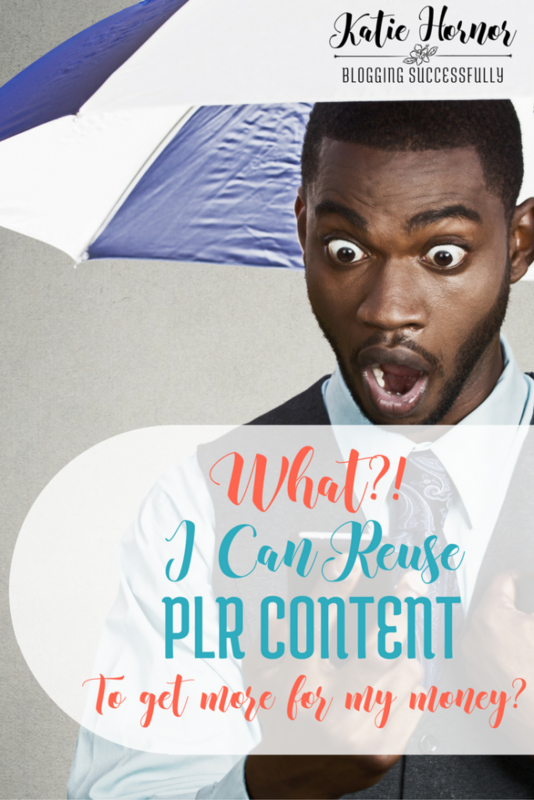 Look through each piece of PLR that you’ve posted and see if there’s something you can pull out from it and turn into a separate blog post. For example, let’s say you have a PLR article about 3 ways to grow your list. Start three new blog posts, paste the main point for each in there, add a new intro, explain in a little more detail or add an example and a screenshot and you have 3 more posts ready to go that make a great follow up to the first one. Or let’s say you bought a pcak of 10 PLR articles on making bone broth and are adding them to your site. While you’re doing that, compile them into a short report and use it as a new lead magnet to build your list. Even better, add a custom optin box at the end of each post inviting readers to sign up for all the bone broth making tips, advice, and recipes. Then repurpose the content again, by creating a series of emails that use a snipet of the content and a link to the blog post. When it comes to repurposing PLR, the sky is the limit. You can also include that same pack of Bone Broth PLR articles in a book or eBook about healthy eating, cooking from scratch, or gettng started with Paleo for example. And don’t forget about PLR when you need to come up with some fresh Social media content. Pull two or three quotes from each piece of content and post it along with a link to your published blog post (or an optin for the short report, or the sales page for your book). We hope you’ve enjoyed this little guest post series on Private Label Rights (PLR) content and are ready to start using it in your online business. Head on over to www.PiggyMakesBank.com and pick up one of our PLR bundles. Coupon code COMOBLOG saves you 50% making it super affordable. Feel free to leave us a comment here or get in touch with us over at Piggy Makes Bank if you have any questions about buying and using PLR content.